Here’s our weekly round-up of news to distract you from the fact that we haven’t had a bank holiday this week and won’t for another 79 days. Not that we’re counting. In case you missed it, Microsoft acquired GitHub for the bargain price of $7.5billion. The news seems to have divided the developer community. Some call the move ‘visionary’ while others point out Microsoft’s previous hatred of open source. You can check out some views of the tech industry over at The Stack, including the views of our own Julian Osman who admitted to ‘having avoided the Microsoft ecosystem for well over a decade’. 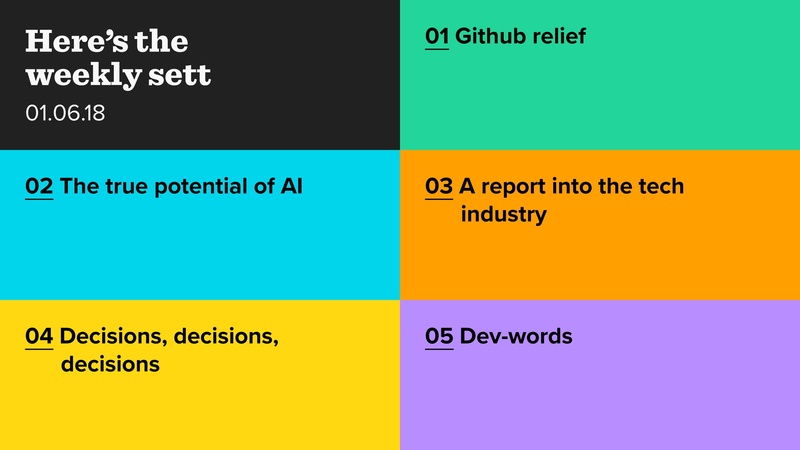 AI is still grabbing headlines. Bloomberg took it one step further and let it write its own headline. Following Google’s announcement of new AI powered products, Bloomberg took a look at their own articles (a data source) and sought to turn them into something new, via machine learning. The conclusion? We don’t need to be as worried about AI as we think… yet. Mary Meeker is back at it again and delivered her much anticipated annual tech industry report. You can pour over the slides at Recode, but Fortune has highlighted some of the key points into a more digestible article. A highlight from the presentation includes the growth of simple-to-use apps, regardless of function. Alongside this user-experience is incredibly important, with data-driven personalisation being key. A poll of 2,000 British consumers has found that we go through 29 stages before making an online clothing purchase. The Independent reports that finding something they like and then buying takes around an hour and 20 minutes of considerations and seeking the opinion of two other people. And from the Red Badger Slack this week, we bring you the latest tool every developer needs- pocket developer die. No longer will you be stuck for words, with one flick of a wrist a generic ‘dev-appropriate’ response can be found.